TS B.Ed Entrance Test rules, TS EdCET Entrance Test Conducting rules for admission into 2 year B.Ed course/ Fresh Rules for conduct of Ed-CET Entrance Test for entry into 2 year B.Ed course as per the GO.13 Dt.27-05-2017, 2 year B.Ed Course admissions rules, TS Education Common Entrance Test Conducting Guidelines. GOVERNMENT OF TELANGANA: School Education Department - Education Common Entrance Test (Ed.CET / Ed.CET- AC), for admission into two (2) years B.Ed Course Rules, 2017 - Orders – Issued. School Education Department – The Telangana Colleges of Education (Regulation of Admissions into B.Ed., Course through Common Entrance Test) Rules, 2006 – Amendment to G.O.Ms.No.92, Education (SE-TRG) Department, dt.16.11.2006 – Notification – Orders – Issued. 1) G.O.Ms.No.92, Education (Trg) Department, dt.16.11.2006. 2) National Council for Teacher Education (Recognition Norms and Procedure) Regulations, 2014, issued vide Notification dt:28.11.2014. 3) G.O.Ms.No.45, Law (F) Department, dt:1.06.2016. 4) G.O.Ms.No.13, School Education (Trg) Department, dt:27.05.2017. 5) From the Secretary, Telangana State Council of Higher Education, Hyderabad, letter LR.No.TSCHE / CETs/ TSEd.CET-2017/July, dt.31.07.2017 & 09.08.2017. Orders were issued in the G.O.1st read above read with G.O. third read above, framing The Telangana Colleges of Education (Regulation of Admissions into B.Ed. Course through Common Entrance Test) Rules, 2006. 2) The National Council for Teacher Education, New Delhi, vide Notification 2nd read above, issued new Regulations, norms and standards which have come into force from the date of their publication in the Gazette of India, wherein changed eligibility criteria among others has been prescribed for admission into the Colleges of Education. 3) In the G.O.3rd read above, orders were issued that all the other Laws, including those made under the adapted Acts, which were in existence as on 2.6.2014, but not adapted as on the date of this Order, shall be deemed to have been adapted to the State of Telangana. 4) Orders were issued in the G.O.4th read above, framing the Education Common Entrance Test (EdCET/EdCET-AC) Rules, 2017 for admissions into (2) year B.Ed Course. 5) The Secretary, Telangana State Council of Higher Education, Hyderabad in his letter fifth read above has proposed certain amendments to the Orders issued in the G.O.Ms.No.92, Education (Trg) Department, dt:16.11.2006. 6) Government after careful examination of the proposal of the Secretary, Telangana State Council of Higher Education, Hyderabad, hereby decided to issue amendments to the G.O.1st read above. 7) Accordingly, the following notification shall be published in the Telangana Gazette. In exercise of the powers conferred by sub section (1) of section 3 and section 15 of the Telangana Educational Institutions (Regulation of Admissions and Prohibition of Capitation Fee) Act, 1983 (Act No.5 of 1983), the Governor of Telangana hereby makes the following amendments to the Telangana Colleges of Education (Regulation of Admissions into B.Ed Course through Common Entrance Test) Rules, 2006 issued in G.O.Ms.No.92,Education (SE-Trg) Department, dt.16.11.2006 and as subsequently amended from time to time. 1) In the short title, for the words, “The Telangana Colleges of Education (Regulation of Admissions into B.Ed Course through Common Entrance Test) Rules, 2006.”, the words “The Telangana College of Education (Regulation of Admissions into two year B.Ed Course through Common Entrance Test) Rules, 2006.” shall be substituted. 2) For the words , “B.Ed Course”, wherever they occur, the words “two year B.Ed Course” shall be substituted. Candidates should have secured 50% marks either in the Bachelors Degree i.e., B.A. / B.Sc. / B.Com / B.Sc (Home Science) / BCA / BBM and or in the Masters Degree or any other qualification equivalent thereto. Bachelors in Engineering or Technology with specialization in Science and Mathematics with 55% aggregate marks or any other qualification equivalent thereto. However, the candidates belonging to reserved categories viz., SC/ST/BC and other reserved categories should have secured 40% marks in the qualifying examination. b) In sub-rule (iv), the words “B.E/B.Tech” shall be deleted. Mathematics Candidates with B.A. / B.Sc with Mathematics as one of the group subjects, B.E/B.Tech with Mathematics and BCA candidates with Mathematics at Intermediate level as a group subject. Physical Sciences Candidates with B.Sc., who have studied Physics and Chemistry or allied subjects under Part-II group subjects as shown in the Annexure, B.E/B.Tech with Physics and Chemistry subjects and BCA candidates with Physical Sciences (Physics and Chemistry) at Intermediate level as group subject. Biological Sciences Candidates with B.Sc / B.Sc (Home Science) who have studied Botany and Zoology or allied subjects under Part-II group subjects as shown in the Annexure, BCA students with Biological Sciences at Intermediate level as group subject. Social Studies All candidates with B.A. /B.Com /B.B.M/BCA students with Social Sciences at Intermediate level as group subject. English The candidates with B.A in Special English/English Literature/MA English. The minimum qualifying marks for ranking in EdCET for other than SC/ST candidates shall be 25% of the aggregate marks (37.50/150 i.e, rounded off to 38 marks). However, there shall be no minimum qualifying marks for the candidates belonging to the category of Scheduled Castes and Scheduled Tribes for ranking. However, the candidates belonging to SC/ST communities shall secure the minimum qualifying marks of 25% marks (37.50/150 i.e rounded off to 38 marks) in EdCET/EdCET-AC to claim a seat under NCC/Sports and Games/Physically Handicapped/Children of Armed Personnel quota. However, Minority colleges of Education shall be allowed to fill up the vacant seats with non minority candidates provided that the non minority candidates do not exceed 30% limit prescribed in G.O.Ms.No.1 Minorities Welfare Dept dt:16.01.2004 and amendments from time to time. However, if 70% of Minority candidates are admitted, the remaining 30% seats shall be filled with non minority candidates who are qualified in EdCET. In case if any college does not fill up the seats with 70% of minority candidates the leftover seats out of the 70% shall be kept vacant for that year and the remaining 30% shall be filled with non minority qualified candidates in EdCET. 5) Rule (11) shall be deleted. 1. Clarificatory Judgment of Supreme Court in Islamic Academy of Education and another Vs State of Karnataka and others dt: 14.08.2003. 2. G.O.Ms.No.72, Education (SE-Trg) Department, dt: 05.07.2004. 3. G.O.Ms. No.37, Education (SE-Trg) Department, dt:.26.05.2007. 4. G.O.Ms. No.30, Education (SE-Trg) Department, dt:20.02.2008. 5. G.O.Ms.No.44, Education (SE.Trg) Department, dt:.17.03.2008. 6. G.O.Ms.No.9, Secondary Education (General.II) Department dt:09.03.2010. 7. National Council for Teacher Education (Recognition Norms and Procedure) Regulations, 2014, issued vide Notification dt: 28.11.2014. 8. G.O.Ms.No.26, Higher Education (HE/TE/A2) Department, dt: 22.07.2015. 9. G.O.Rt.No.160, Higher Education (TE/A2) Department, dtd.22.07.2015. 10.G.O.Rt.No.307, Higher Education (TE/A2) Department, dtd.28.11.2015. 11.G.O.Ms.No.45, Law (F) Department, dt:01.06.2016. 12. From the Secretary, Telangana State Council of Higher Education, Hyderabad, letter.No.TSCHE/Secy/CETs/April- 2017, dt.22.04.2017 & 12.05.2017. O R D E R : Orders were issued in the G.O. 2nd read above framing Rules for the conduct of Education Common Entrance Test (Ed-CET/Ed-CET-AC) for entry into B.Ed course, based on the Apex court Judgment 1st read above and the Rules were amended from time to time in the G.Os 3rd, 4th, 5th and 6th read above. 2) The National Council for Teacher Education, New Delhi, vide Notification 7th read above, issued New Regulations and Norms and standards which have come into force from the date of their publication in the Gazzette of India, wherein changed eligibility criteria among others has been prescribed for admission into the Colleges of Education. 3) In the G.O. 8th read above, orders were issued adapting the Andhra Pradesh Admission and Fee Regulatory Committee (for Professional Courses offered in Private Un-Aided Professional Institutions) Rules, 2006, to Telangana State. In the G.Os 9th and 10th read above, orders were issued constituting the Admission and Fee Regulatory Committee for regulating Admissions and Fee Fixation in Private Un-Aided professional Institutions. 4) In the G.O 11th read above, orders were issued that all the other laws, including those made under the adapted Acts, which were in existence as on 02.06.2014, but not adapted as on the date of this Order, shall be deemed to have been adapted to the State of Telangana. 5) The Secretary, Telangana State Council of Higher Education, Hyderabad, in his letters 12th read above, has furnished proposals for issue of fresh rules for the conduct of Education Common Entrance Test (Ed-CET/Ed-CET-AC) for entry into B.Ed course in supersession of the orders issued in the G.O 2nd read above as amended from time to time, keeping in view the National Council for Teacher Education Regulations, 2014. 6) The Government after careful examination of the proposals of the Secretary, Telangana State Counsel of Higher Education, hereby decided to issue fresh Rules for conduct of Education Common Entrance Test (Ed-CET/Ed-CET-AC) for entry into B.Ed course. In exercise of the powers conferred by Sections 3 and 15 of the Telangana Educational Institutions (Regulation of Admissions and Prohibition of Capitation Fee) Act, 1983 and in supersession of the Telangana Conduct of Education Common Entrance Test for admission into B.Ed Course Rules, 2004 issued in G.O.Ms.No.72, Education (SE-Trg) Department, dt:05.07.2004, along with the amendment orders issued in G.O.Ms.No.37, Education (SE-Trg) Department, dt:26.05.2007; G.O.Ms.No.30, Education (SE-Trg) Department, dt:20.02.2008; G.O.Ms.No.44, Education (SE-Trg.) Department, dt:17.03.2008 and G.O.Ms.No.9, Secondary Education (Genl.II) Department, dt:09.03.2010, the Governor of Telangana hereby makes the following Rules for the conduct of Common Entrance Test for admission into 2-year B.Ed Course, in consonance with the National Council for Teacher Education Regulations, 2014. (ii) They shall apply to admissions into 2-year B.Ed course offered by the Colleges of Education (viz.,Government Colleges of Teacher Education, Institute of Advance Studies in Education (IASE), University, Private Aided, Unaided Private Minority and Non Minority) in the State. (iii) They shall come into force with immediate effect. (i) “Act” means, The Telangana Educational Institutions (Regulation of Admission and Prohibition of Capitation Fee) Act, 1983. (Act No: 5 of 1983). (ii) “Association of Colleges” means, the Association of Colleges formed for the purpose of conducting Education Common Entrance Test Ed.CET-AC and recognized by the Telangana State Council of Higher Education. (iii) “Chairman/Chairperson” means, the Vice-Chancellor of any University in the State nominated by the Chairman, Telangana State Council of Higher Education (Competent Authority) for each Academic Year for conducting Education Common Entrance Test held by the State Agency. He/she shall also be the Chairman of the Education Common Entrance Test Committee (Ed.CET Committee). (iv) “Education Common Entrance Test Committee” means, the Committee empowered to conduct Education Common Entrance Test and to prepare the merit list of the candidates as per the marks obtained in Education Common Entrance Test for admission into Convener seats and the management seats in Colleges of Education which agree to make admissions into B.Ed course based on the ranking in the Education Common Entrance Test. (v) “Education Common Entrance Test Committee - AC” means, the Committee of members empowered by the Association of Private Un-Aided colleges to conduct Education Common Entrance Test -AC for admission into 2-year B.Ed course and to prepare the merit lists of candidates as per the marks obtained in the above test for admission into Convener and Management seats subject to the supervision of Telangana Admission and Fee Regulatory Committee (TAFRC). (vi) “Competent Authority” means, the Chairman of the Telangana State Council of Higher Education. (vii) “Convener” means, a person, not below the rank of a Professor/Joint Director of School Education, Govt. of Telangana, appointed by the Competent Authority in consultation with the Chairperson from a panel of three senior professors provided by him/her for conducting the Education Common Entrance Test and performing such other functions relating to the said test as entrusted to him/her by the Competent Authority. (viii) “Convener Seats” means, the seats earmarked from out of the sanctioned intake of seats in each institution to be filled by the Convener. (ix) “Education Common Entrance Test” (herein after called Ed.CET) means, examinations conducted for assigning ranks by merit to the candidates which will be the basis for admission into 2-year B.Ed course. (x) “Education Common Entrance Test of Association of Colleges” herein after called (Ed.CET-AC) means, the Test conducted by Association of Private Un-Aided colleges for assigning merit ranking to candidates which shall be the basis for admission of candidates into the member colleges of the Association of Colleges in the State offering 2-year B.Ed course. (xi) “Government” means, the State Government of Telangana. (xii) “Management Seats” means, the seats earmarked from out of the sanctioned intake of seats to be filled by the Managements of the Private Unaided Colleges of Education in both Non Minority and Minority Colleges of Education including the seats to be provided for the concerned minority candidates in minority colleges of education. (xiii) “Qualified Candidate” means, the candidate who has appeared for the Ed.CET/Ed.CET-AC and has been assigned rank in the common merit lists and has the eligibility as per the criteria laid down under Rule (3). (xv) “State Council” means, The Telangana State Council of Higher Education constituted under Telangana State Council of Higher Education Act, 1988 (Act 16 of 1988). (xvi) “Service Provider” means, an agency to be outsourced through e- tendering by an Expert Committee constituted by the Competent Authority to provide software and support services for handling online processing of pre, during and post examination works. (xvii) “Telangana Admission and Fee Regulatory Committee”, here in after called as TAFRC, means, the Committee constituted by the Government for regulating the admissions and fixation of fees to be charged from candidates seeking admission into Private Un-Aided Minority and Non Minority B.Ed colleges in the State. (xviii) “University” means, the University concerned in which the particular courses are offered. (2) Words and Expressions used but not defined in these rules shall have the same meaning assigned to them under the Telangana Educational Institutions (Regulation of Admissions and Prohibition of Capitation Fee) Act, 1983 (Act 5 of 1983). Candidates satisfying the following requirements shall be eligible to appear for Ed.CET / Ed.CET-AC and for admission to 2-year B.Ed course. (i) The candidate should be of Indian Nationality. (ii) The candidate should satisfy ‘local’/’non-local’ status requirements as laid down in the Telangana Educational Institutions (Regulation of Admission) Order, 1974, as subsequently amended. (a) In any Bachelors Degree i.e., B.A, B.Com, B.Sc, B.Sc (Home Science), BCA, BBM or in the Masters Degree, securing at least 50% aggregate marks. (c) Any other qualification equivalent thereto. (d) However, for candidates belonging to the reserved categories viz., SC/ST/BC and other reserved categories should have secured 40% marks in the qualifying examination. /BHMT/B.Pharm and such other professional and job oriented degree courses viz., LL.B are not eligible for admission into B.Ed course. (f) Candidates possessing a Master Degree without having undertaken Under Graduate study are not eligible for admission. The candidates should have completed the age of 19 years as on 1st July of the year in which notification is issued. There shall be no maximum age limit. (i) The Ed.CET shall be conducted by the Convener, appointed by the Competent Authority and shall be held on such date and at Centers as approved by the Ed.CET Committee. (ii) The Convener of Ed.CET shall give a notification in the popular daily News Papers as decided by the Ed.CET Committee calling for the applications Online in the prescribed form from the candidates who desire to appear for Ed.CET and satisfying the eligibility criteria as laid down in Rule (3). (iii) The notification, among other things, shall indicate the Registration Fee and Entrance Test Fee, the last date for receipt of the duly filled in applications online and the date of conduct of Ed.CET. (iv) The Date of the entrance test as notified above in para Rule (4) (iii) shall be as approved by the Committee of Ed.CET. (vi) The subjects, syllabus and pattern of question paper of Ed.CET, duration of the test, weightage to be given to each part of the question paper shall be as prescribed by the Expert Committee constituted with subject Experts for the purpose by the Competent Authority. (vii) (a) Ed.CET shall be conducted in the following methodologies to enable the eligible and qualified candidates from the test against the percentage of seats earmarked for admission into B.Ed course. seats maximum in each methodology. of the seats minimum and 15% of seats maximum in English methodology. (b) The Minimum qualifying marks for ranking in the Ed.CET for other than SC/ST candidates shall be 25% of the aggregate marks. However, there shall be no minimum qualifying marks for the candidates belonging to the category of Scheduled Castes and Scheduled Tribes for ranking. (viii) The candidates who have obtained qualifying marks in the Entrance Test shall be assigned ranking for each methodology in the order of the merit on the basis of the aggregate marks obtained in the Entrance Test. Response Sheets (Answer Scripts) of the Entrance Test. (x) Mere appearance at the Entrance Test does not automatically entitle a candidate to be considered for entry into 2-year B.Ed course unless the candidate satisfies the requirement of eligibility and other criteria laid down in these Rules and the rules for admission. (xi) If any ambiguity or doubt arises in the interpretation or implementation of any of the rules, the decision of the Competent Authority shall be final. The Convener shall observe the following with the support services of the Service Provider in pre, during and post examination work, in preparing the merit list and assigning the ranks. (i) The candidate who have secured qualifying marks in Ed.CET as prescribed in rule 4 (vii) (b) and candidates belonging to the category of Scheduled Castes and Scheduled Tribes, to whom qualifying marks have not been prescribed, shall be assigned the rank in the order of the merit on the basis of the aggregate marks obtained in the Ed.CET. (ii) The Ed.CET Committee shall prepare the merit list for each of the reserved categories viz., SC/ST/BC/Minority/PWD separately for each of the methodologies viz., Mathematics, Physical Sciences, Biological Sciences, Social Studies and English. (a) In case of tie in the aggregate, marks obtained in the parts of the test paper related to (1) firstly content background of related methodology and (2) then General English, the same order shall be taken into account to decide relative ranking. (b) In the case of candidates getting equal marks in each of the parts of the test paper, age shall be taken into consideration for relative ranking among such candidates, and the older candidates shall be given priority. (a) State-wide Common Merit List: The list shall include the candidates, based on the marks obtained in the Ed.CET irrespective of whether one belongs to any category of reservation quota. (b) Region–wise Common Merit List: The list includes the candidates based on the marks obtained in the Ed.CET belonging to the particular local area irrespective of whether one belongs to any category of reservation quota. (c) Minority Community Merit Lists: - This includes merit lists, containing the candidates belonging to the different Minority Communities arranged in the Merit ranking assigned in the Ed.CET, both State-wide and Local Area -wise. (e) Merit list for other categories of reservations: There shall be separate lists for other categories of reservations as per the orders in force for Persons with Disability (PWD), NCC, Games and Sports, Children of ex-servicemen and for Women both State-wide and Local Area -wise. (f) Every candidate who has been assigned rank in the merit list shall be issued Rank Card by the Convener. The Rank Card, among other things, shall include the marks obtained in the Ed.CET and the rank assigned in the State-wide merit, Local Area wise merit, reserved categories merit, minority community wise merit etc. (g) Mere mentioning religion in the Rank card as claimed by the candidate shall not entitle the candidate a Minority status. It needs to be proved later as per rules. The Competent Authority shall constitute the Ed.CET Committee to deal with the matters connected with the test for smooth conduct of it. (i) Chairman/Chairperson, nominated by the Competent Authority for each academic year for the purpose of conducting Ed.CET. (ii) One representative from each of the Universities to be nominated by the Competent Authority in consultation with the Vice-Chancellor concerned. (iv) One representative of TSCHE nominated by the Competent Authority. (v) Convener of the Ed.CET of the preceding year. (vi) Convener, to be appointed by the Competent Authority in consultation with the Chairman of the Ed.CET Committee. (vii) Principal of Institute of Advanced Studies in Education (IASE). (i) Application Registration fee to be collected from the candidates of Ed.CET. (iii) Approval of Ed.CET notification. (iv) Centers for conducting the test – Approval of Centers as identified by the Convener. (v) Norms for the payment of remuneration for different items / services undertaken in connection with Ed.CET work. (vi) Budget for the conduct of Ed.CET. (vii) Date of announcement of results. (i) Chairman shall preside over all the meetings of the Committee and in his / her absence he / she may nominate one of the members of the Committee to preside over the meetings. (ii) Chairman shall appoint paper setters, moderators for the Ed.CET and decide upon the service provider for online examination/printing press or presses where the confidential material of the Test shall be printed. (iii) The Chairman may appoint a competent officer to assist the Convener. (i) The designing of application form of Ed.CET. (ii) Issuing the notification inviting applications online for the Entrance Test. (iii) Registration of online applications and issue of Hall Tickets. (iv) Fixing of Test Centers for offline exam and for Online Test Centers in consultation with the Service Provider. (v) Appointment of Regional/ City Coordinators/ Chief Superintendents / General or Special Observers of various Test Centers. (vi) Co-ordination and Supervision of the confidential work and safe custody of confidential material. (vii) Appointment of Members of Confidential team for assisting computer/electronic process in valuation of answer scripts and other confidential works. (ix) Preparation of key answers to the test paper through a Committee consisting of Professors of Universities in consultation with the Chairperson. (x) Confidential work of evaluating Answer scripts. (xi) Publication of results and arranging downloading of Rank Cards to the qualified candidates. (xii) Preparation of budget of Ed.CET in consultation with TSCHE. (xiii) Payment of remuneration for various items / services utilized for the purpose of Ed.CET. (xiv) Maintenance and submission of audited accounts to the TSCHE. (xv) Such other duties as entrusted by the Chairperson or Competent Authority from time to time. (i) The amounts that are collected from the candidates towards Registration fee and Entrance Test Fee shall be directly credited into the account of the Secretary, Telangana State Council of Higher Education, Hyderabad. (ii) The Convener shall draw advances from the Telangana State Council of Higher Education, Hyderabad to incur necessary expenditure for items/services connected with the Ed.CET and submit accounts for the audit of the Local Fund Audit and report thereof shall be submitted to the Telangana State Council of Higher Education. In the event of any malpractice or leakage of question paper or in any other circumstances leading to the stopping of Ed.CET as scheduled, the Government may, for reasons to be recorded in writing, direct the conduct of a re-examination of the Ed.CET. In such an event the Telangana State Council of Higher Education or any other body so nominated by the Government shall cause the Ed.CET re-examination to be conducted by appointing/nominating such functionaries or Committees, as considered necessary, without levying any extra fees from the candidates for this purpose. (i) There may be Association(s) of Private Unaided Colleges recognized by Telangana State Council of Higher Education, Hyderabad as defined in clause (ii) of sub rule (1) of Rule 2 of these Rules to conduct Ed.CET-AC. (ii) The Secretary(s) of Association (s) of Colleges formed, as in clause (i) above, shall intimate their formation, rules and byelaws and names of Office Bearers and member Colleges to the Competent Authority and TAFRC before a date stipulated by the Competent Authority. The State Council will accord recognition to the Association(s) who submits the above particulars and documents before the stipulated date. (iii) Irrespective of the number of Association(s) recognized under clause (ii) above, they can conduct only one Ed.CET-AC for entry into 2-year B.Ed course by forming a Consortium of Associations for the purpose. The TAFRC shall issue notification, inviting options from the Managements of all the B.Ed Colleges, for admitting their students either through Ed.CET or Ed.CET-AC. (iv) The option of choosing, between of either Ed.CET or Ed.CET-AC shall be exercised by the Managements of the colleges and shall be intimated in writing before a stipulated date to the Competent Authority and the TAFRC. In case of failure on the part of any management to exercise their option it shall be construed that they shall admit the candidates into their colleges on the basis of the rank at Ed.CET conducted by the Convener. The Ed.CET Committee - AC shall be constituted by the Association of Private Unaided Colleges of Education offering 2-year B.Ed course with eminent members and academicians representing all the disciplines included for the test. A member of this Committee shall be appointed as Convenor of the Ed.CET Committee - AC to discharge the functions as assigned by the Committee. This should be communicated to the Competent Authority and TAFRC. (i) Ed.CET-AC shall be conducted in a fair and transparent manner subject to the supervision of the TAFRC and it shall submit the proposed question papers, the names of the paper setter and examiners and the method adopted to ensure papers are not leaked etc, whenever such information is called for by the TAFRC and as per the TAFRC rules framed in this regard. (ii) The Ed.CET Committee - AC shall preserve the question paper and the answer papers for the period as indicated by the TAFRC. (iii) After holding Ed.CET-AC and declaration of the results of Ed.CET-AC, each Member College of the Association of Colleges shall immediately display the merit lists on the notice Board of all the Colleges, which have chosen to admit Students on the basis of rank obtained at ED.CET-AC concerned. (iv) The Ed.CET Committee - AC shall also communicate a copy of the merit list forthwith to the Competent Authority and the TAFRC. 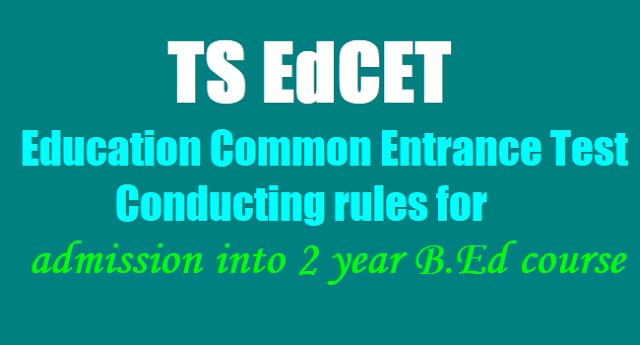 (v) The Ed.CET Committee - AC shall follow the same guidelines as prescribed in rule (3) and (4) of these rules for eligibility criteria, conduct of test, minimum qualifying marks in the test, declaration of results, assigning Merit Ranks etc and also follow the relevant TAFRC Rules in all the matters connected to Ed.CET-AC . The amounts that are collected from the candidates towards Registration Fee of the applications and Entrance Test Fee shall be utilized to meet the expenditure for items/ services connected with the Ed.CET-AC. Accounts shall be subjected to audit and report thereof shall be submitted to the Competent Authority and the TAFRC. The TAFRC shall ensure that the Ed.CET - AC is conducted in a fair and transparent manner. If the TAFRC comes to the conclusion, after giving an opportunity of representation, that the Ed.CET - AC was not conducted in a fair and transparent manner, it shall have the power to cancel the test and order, either for a fresh test to be conducted by the Convenor, without charging any extra fee for the purpose from the candidates, or recommend to the Competent Authority to step in and conduct re-examination. In the latter event, the Association of Private Unaided Colleges shall reimburse the expenditure incurred in that regard as determined by the Competent Authority.